It's no secret smartphone and tablet speakers are bad. You just can't get very good sound out of a small, flat object designed to fit in your pocket. Fortunately, you don't have to rely on your smartphone or tablet to put out sound when you're on the go. 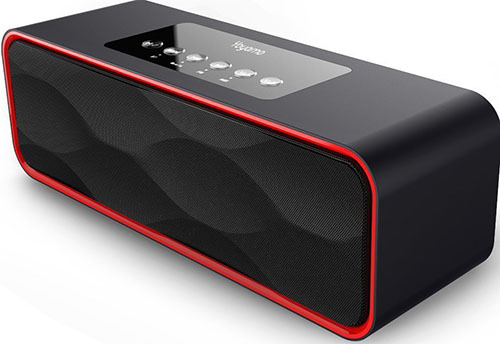 Portable Bluetooth speakers are the best way to bust out the jams wirelessly when you can't carry around your entire sound system, which is pretty much all the time. Thanks to integrated Bluetooth, the speakers here work with Android, iOS, and, well, any Bluetooth-enabled device, including most laptops and desktops. Also, they don't require a Wi-Fi network, making them much more flexible than Apple-only AirPlay speakers. Still, there are a few things to consider when picking a Bluetooth speaker. Bluetooth speakers are usually portable, but they don't have to be. Some speaker systems are built for connecting to your PC or HDTV, and Bluetooth connectivity is a secondary function, like the excellent Audioengine HD3. These types of speakers are great if you want wireless audio at home, but you can't easily haul either of them around, unlike many of the smaller, more bag-friendly speakers on this list. For more options, check out The Best Computer Speakers. Most, but not all, Bluetooth speakers use rechargeable batteries, so you can take them anywhere and use them without a power outlet. Some larger speakers, especially those intended for home theater or PC use, need a dedicated power supply to run, even though you can connect your devices to them wirelessly. Size is often a trade-off for power; the smaller a speaker, the less powerful it will likely sound. Not all portable speakers are built to be carried around outdoors, or used by the pool. Rugged speakers can handle splashes, dunks, drops, and gunk and keep running. If you try that with the non-rugged speakers on this list, however, you'll find yourself with a brick instead of an audio device. Look for speakers with IPX ratings and guarantees of water and shock resistance if you want to carry them around to the beach, the lake, the slopes, or the sewers. Beyond an auxiliary input (so you can connect your smartphone or tablet with a wire, if you wish), you'd be lucky to find much else in the way of connectivity on most Bluetooth speaker systems. Even a 3.5mm aux input isn't a certainty if you're getting a particularly small or inexpensive speaker. However, some speakers can serve multiple purposes, and even use multiple wireless standards. Apple's AirPlay used to be completely separate from Bluetooth and other Android-friendly wireless systems, but now there's plenty of overlap, and you can find some speakers pulling double-duty as both Bluetooth and Wi-Fi systems. The Libratone Zipp Mini, for instance, doubles as an AirPlay and Spotify Connect speaker. Other speakers, like the JLab Block Party, can be paired together (in its case over a 5.8GHz channel) for multiroom audio, similar to what you get with a speaker like the Sonos Play:1. The Amazon Echo, meanwhile, is primarily a voice-controlled speaker that can work autonomously once it's connected to your Wi-Fi network; you can just tell it to play music, if you don't want to stream audio over Bluetooth. These multi-platform speakers sacrifice portability for their flexibility, however. For more options that aren't necessarily Bluetooth, see The Best Wireless Speakers. Bluetooth speakers come in a wide range of prices. Don't assume, however, that the most money always buys the best overall product. Generally speaking, higher-end models do sound better, but sometimes they lack the features you might expect for the price. The trick is to get the best sound, along with the features you want, at a price you can afford. Bottom Line: The Marshall Kilburn portable Bluetooth speaker delivers a powerful audio performance that can be tweaked to your liking. Bottom Line: The B&O Play Beolit 17 speaker provides a bass-forward, balanced Bluetooth audio experience at a slightly lower price than its predecessor. Bottom Line: The Libratone Zipp Mini speaker delivers a bass-forward, user-friendly Bluetooth and Wi-Fi audio experience that can be used in multi-room scenarios. Bottom Line: The new UE Boom 2 Bluetooth speaker from Ultimate Ears packs powerful sound in a colorful, rugged, waterproof build. Bottom Line: The Bose SoundLink Color II delivers a strong Bluetooth audio experience in a compact, outdoor-friendly design. Bottom Line: The EcoXGear EcoSlate speaker is built like a tank and delivers solid audio, making it a good value for outdoor enthusiasts who want to take their tunes with them.